Valentines Day hasn't been much about romance for us as it has been about fun - it started this way when we were kids. Our mom is a mathematician and very creative! She would always help us make fun valentine boxes to take to our classes at school. 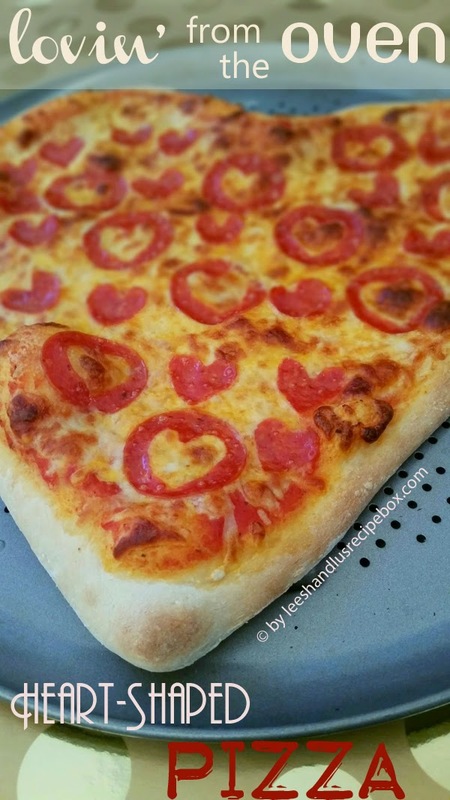 She made a giant heart shaped cookie every year, and sometimes we had heart shaped pizza. A few weeks ago we shared a 4 part series on Pizza. 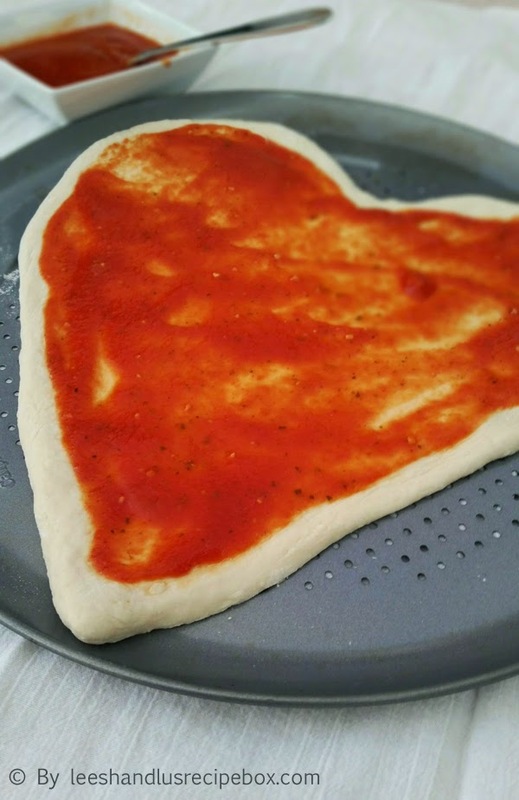 We shared our favorite pizza tools, our favorite dough and how to make the perfect crust, a favorite homemade sauce, and some of our favorite pizza toppings. 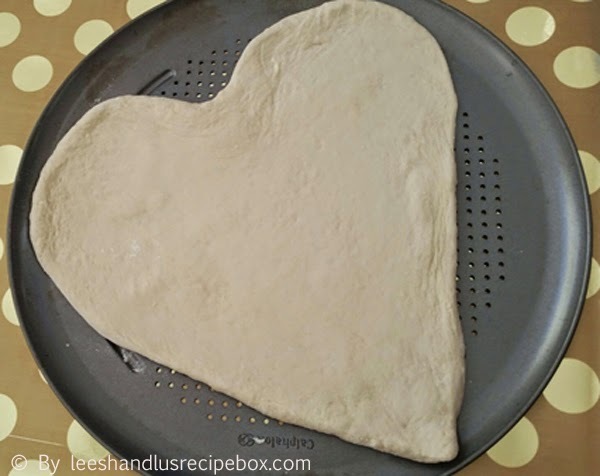 We've used the same pizza dough to make this fun heart shaped pizza and we shared it over at landeelu.com a few weeks ago. We went all out and even topped it with fun heart shaped pepperoni. 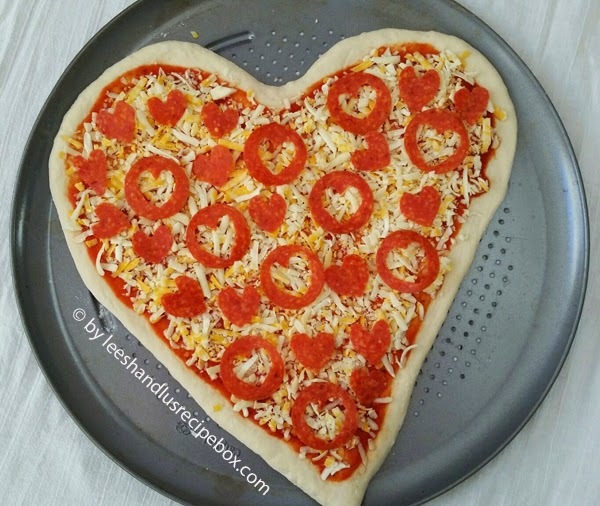 If you aren't a pepperoni fan, use ham (or cut some veggies like hearts), or the heart shaped crust will be fancy enough, right? 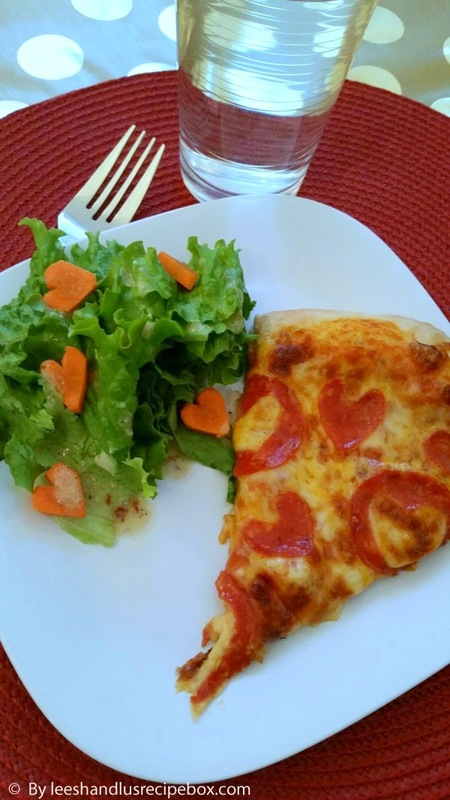 I even made some salad with heart shaped carrots to go with the pizza. ..and pulling and shaping into a heart shape. 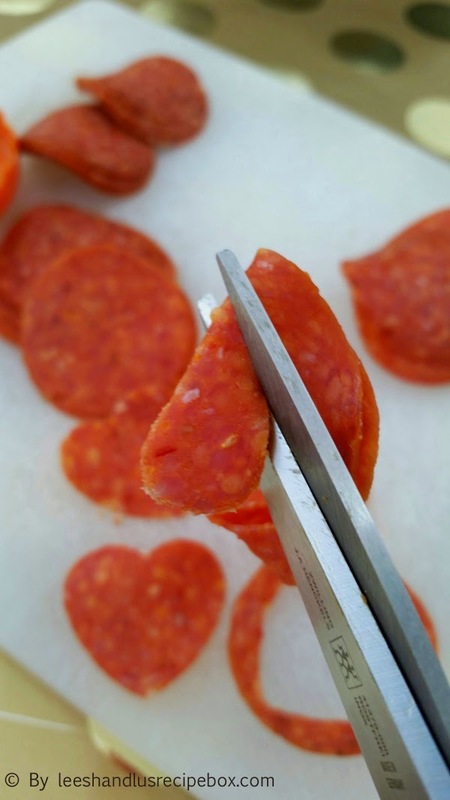 Keep going down to see more pictures of how we did the pepperoni. In mixing bowl add warm water, sugar and instant yeast. Let sit for 3 minutes or so until sugar and yeast are softened. Since it's instant yeast there is really no need to let it proof like regular yeast (if all you have is regular yeast - let it sit for 5 minutes or so until it's slightly bubbly). Add salt, oil, and flour and knead in mixer for 3 minutes or by hand for 5-8 minutes. 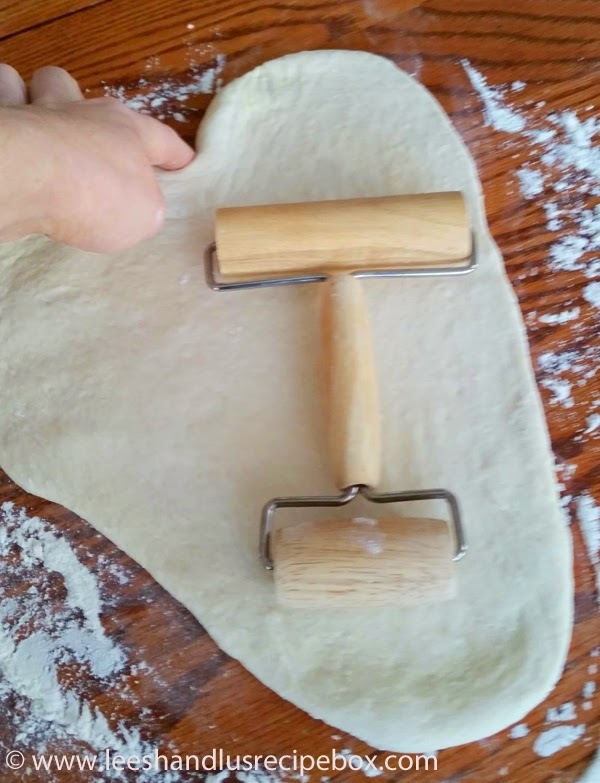 You want the dough to pull away from the sides of the bowl or counter (just don't over flour the dough or it will turn out a little dry and chewy). 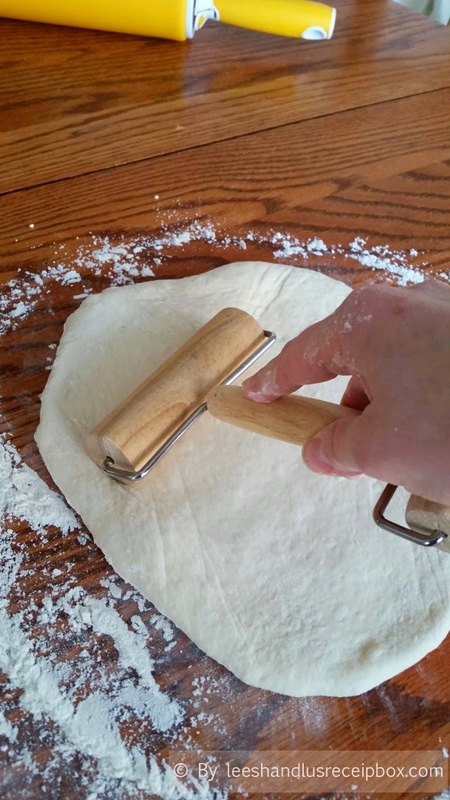 You'll know the dough is floured well when it pulls from the sides and still has a slight tacky touch to it. This dough freezes great. 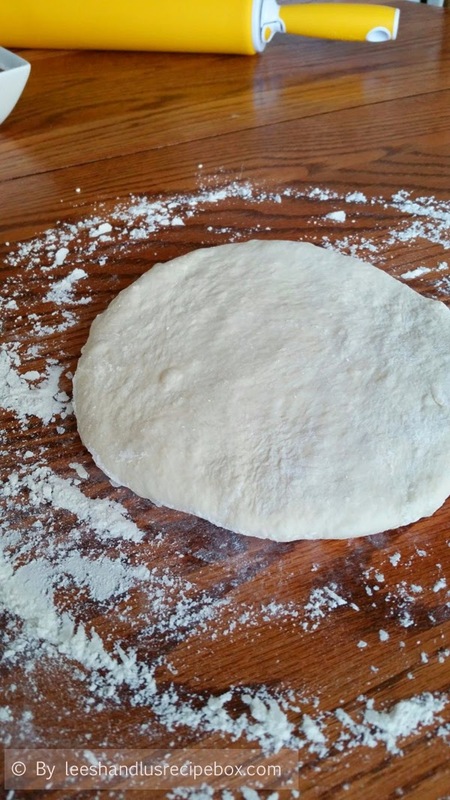 I freeze it in quart freezer bags with enough dough for one crust. Move from fridge to freezer the morning of or night before you plan to use it. 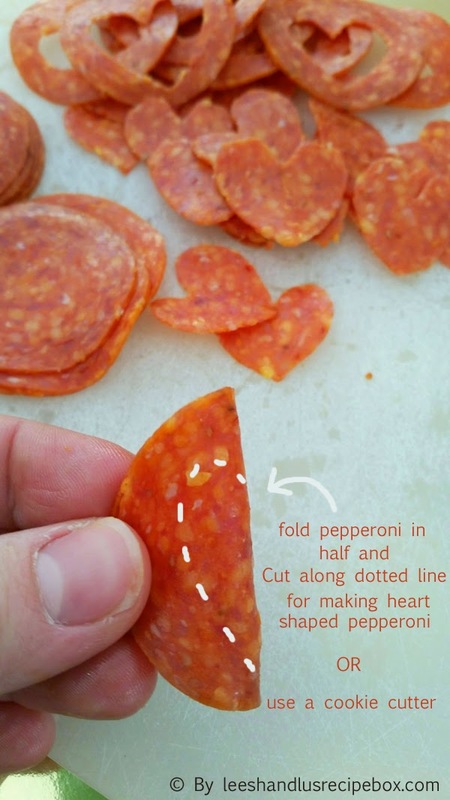 Remove from fridge 30 minutes to an hour before rolling out to allow dough to come to room temperature. .
Once the dough is shaped, spread it on your favorite sauce, and top with cheese and if you'd like some heart shaped pepperoni (see picture tutorial below). Bake (recipe above) and enjoy! This is what we like to call "Lovin' from the Oven"!